← Bolivian indigenous people confirm rejection of dams! Regardless of who is at the Bolivian government, my respect and admiration for the Bolivian Park Rangers, for the local and international NGOs that over decades, have helped our biodiversity, thank you! The above opinion is from Bolivian Thoughts. The large-scale harvesting of the yellow-spotted Amazon river turtle (Podocnemis unifilis) for human consumption has contributed to the species’ decline, according to scientists. It is currently classified as vulnerable by the IUCN. A series of raids in mid-2017 saw authorities seize more than 50,000 river turtle eggs from poachers in the Beni department of Bolivia. A conservation project is trying to help river turtle populations recover, and has released 70,000 baby turtles into the Maniqui River since 1992. BENI DEPARTMENT, Bolivia — The sound of hundreds of excited children drowns out the gentle hum of nature. Those closest to the shoreline hold in their hands, some for the first time, the tiny babies of a species of river turtles known locally as peta de río. 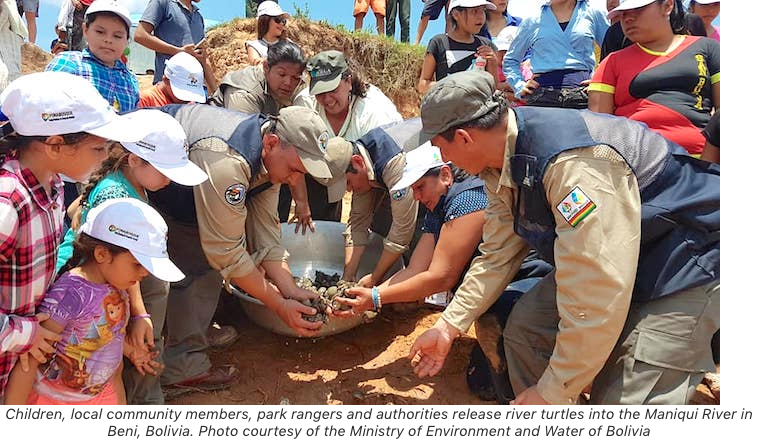 On the morning of Dec. 9, 2017, the children, together with their parents, other adults, authorities and park rangers, participated in the crowning activity of the Quelonio Project: the release of 2,500 yellow-spotted Amazon river turtles (Podocnemis unifilis) into the Maniqui River, in San Borja in Bolivia’s Beni department. The baby turtles, who had never felt water before, instinctively knew what to do. They began to swim, starting a journey to unknown paths in the Bolivian Amazon. Although their future is uncertain, these particular turtles are very lucky: many of their counterparts weren’t even able to hatch. They died as embryos, at the hands of traffickers, who manage to extract and illegally sell thousands of river turtle eggs despite the strict control of authorities. This is the main threat to the species. The yellow-spotted Amazon river turtle is the second-largest species in its genus, after the Arrau turtle (Podocnemis expansa). They can grow to a length of 50 centimeters (20 inches) for females and 33.5 centimeters (13 inches) for males, and weigh between 9 and 12 kilograms (20 to 26 pounds). They are named after the yellow spots on their heads, which are brightest on young turtles and adult males, and fade on females’ heads over time. As members of a suborder known as side-neck turtles (Pleurodira), they cannot fully retract their heads into their shells; instead, they bend their necks to the side, leaving a part exposed. This species of turtle is distributed throughout the basins of the Amazon and the Orinoco rivers, which include Venezuela, Colombia, Ecuador, Peru, Bolivia, Guyana, French Guiana, Suriname and Brazil. In Bolivia, the river turtle has been reported in the departments of Pando, Beni, Cochabamba, La Paz and Santa Cruz. The yellow-spotted Amazon river turtle is sensitive to environmental changes and therefore functions as a biological indicator to determine and measure variations in the ecosystem, according to Federico Moreno, director of the Center for the Investigation of Aquatic Resources (CIRA) at the Autonomous University of Beni (UAB). Moreno says the river turtle provides an an important contribution to the nutrient cycle. “Being a mainly frugivorous species, it goes into flooded forests and turns into an important disperser of seeds in the Bolivian Amazon,” Moreno said. During Bolivia’s dry season, from August to September, the turtles leave between six and 52 eggs on the riverbanks, about 20 centimeters (8 inches) below the ground. 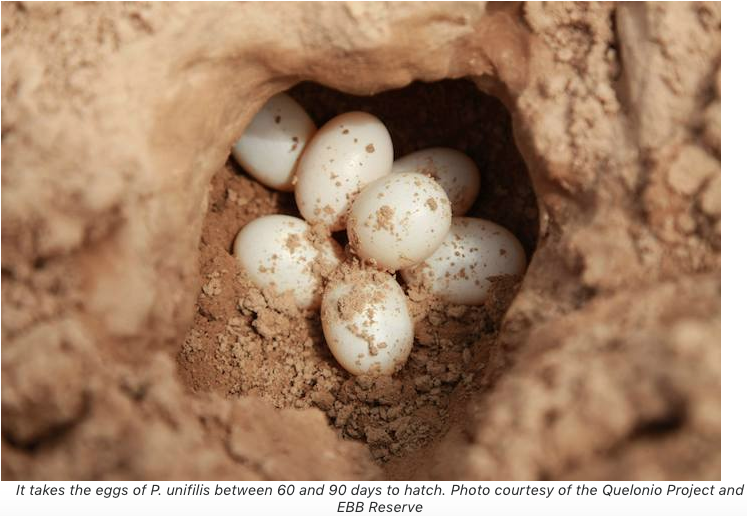 The eggs incubate for 60 to 90 days, depending on the rainfall. Spawning usually takes place at night. Despite legislation and enforcement to prevent the theft of the eggs, it is still common to find river turtle eggs in markets and restaurants in Beni department. 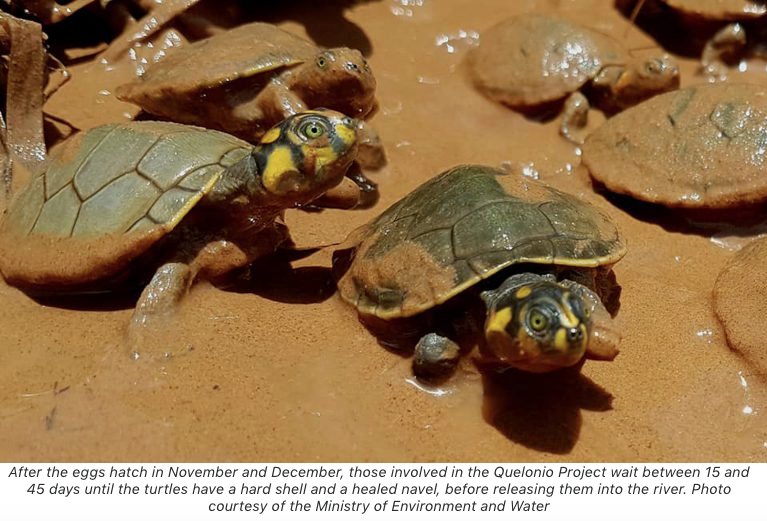 The Quelonio Project began in 1992 with the goal of increasing the survival rates of the eggs and newly hatched turtles, and in the more than 25 years since has been dedicated to rescuing these river turtles in Bolivia. 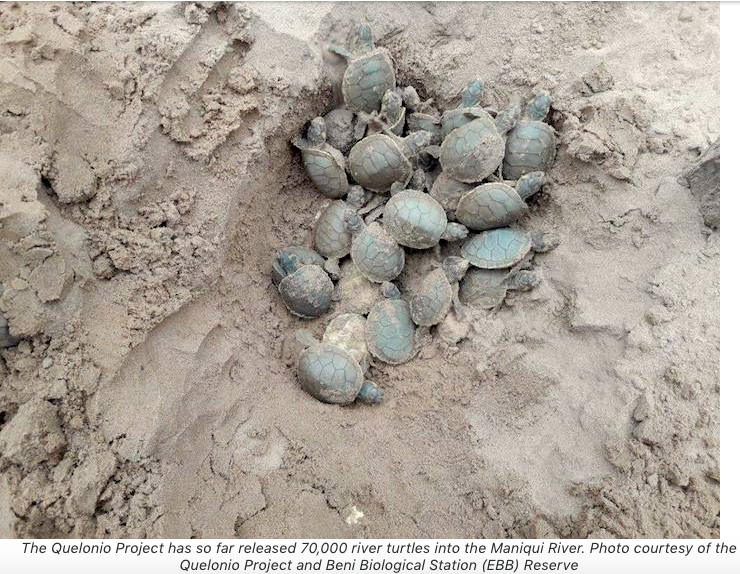 To date, the initiative has resulted in the release of 70,000 river turtles into the Maniqui River. It all started in the Beni Biological Station (EBB) Biosphere Reserve, a national protected area spanning 1,350 square kilometers (520 square miles) over parts of San Borja and Santa Ana de Yacuma, both in Beni department. The EBB Reserve is one of three biosphere reserves in Bolivia. The EBB Reserve’s park rangers are the heroes of this story. They are responsible for carefully collecting the eggs that the turtles lay on the banks of the Maniqui River. They then transfer them to an artificial beach that they guard alongside indigenous people from nine different Tsimané communities who live around the protected area. “While navigating the Maniqui River, while we were on patrol, we noticed the scarcity of the river turtles and that was what motivated the reserve to begin the repopulation of the turtles,” said Jhonny Mano, a park ranger who has participated in the Quelonio Project for 22 years. The artificial beach where the eggs are incubated has a higher elevation than the riverbanks, to avoid any floods that might damage the eggs. After the hatching, usually in November or December, the guards wait for 15 to 45 days to ensure the baby turtles’ shells are hard and their navels are healed. Then they can begin to plan the next task: the release. 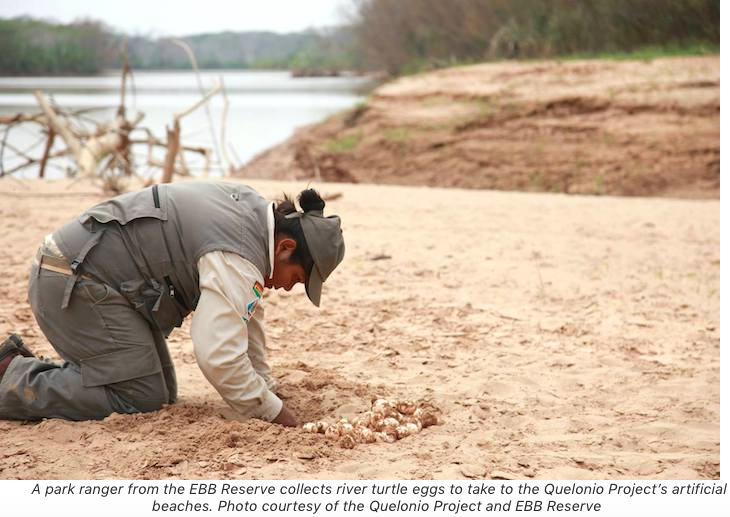 “In order to move forward on the actions of this project, the park rangers need to put in extra effort,” said Carola Vaca, director of the EBB Reserve and a passionate conservationist who has dedicated herself to the Quelonio Project. “This is because they combine their routine patrolling activities in the area with the activities that are required by the initiative. This includes doing things like the collection of eggs to move them to the artificial beaches, in addition to the protection and care of the nests, to avoid theft on the part of the community members,” she said. Just as Vaca and her team collect the eggs to incubate them and later repopulate the rivers with turtles, there are others who take them expressly for the illegal trade in turtle eggs. Between August and September 2017, authorities seized 50,000 turtle eggs during various operations carried out in Beni department, according to Ingrid Loreto Zabala, the Beni departmental secretary of environment and natural resources. In one of those operations, carried out in September 2017 in Trinidad, the Beni departmental capital, military officers seized nearly 5,400 river turtle eggs, reportedly valued at around $1 per egg on the local black market. Abroad, the price can go up by 80 percent. 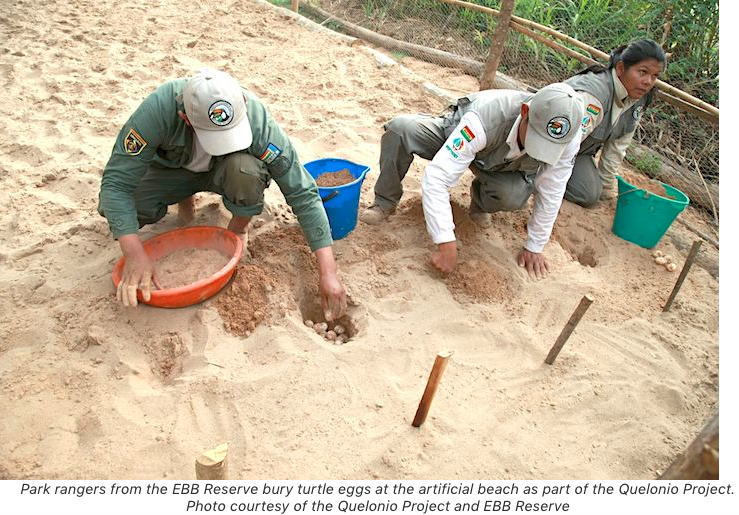 “When someone kills a turtle or takes the eggs from the beach, that person is threatening the heritage of all Bolivians,” Zabala told local media after last year’s raids. In Bolivia, the environment law prescribes prison terms of up to three years for anyone convicted of taking or selling any species of wildlife. A separate article in the penal code stipulates a maximum sentence of six years for damaging or destroying state property or national wealth, a category that includes endangered wildlife such as river turtles. Two other laws on general and indefinite closed season, passed in the 1990s, regulate the capture, stockpiling and handling of wild animals. “Do not encourage illicit [activities]; trafficking has a penalty,” Teresa Pérez, the vice minister for the environment, told local media last December. Moreno, from the aquatic resources center, says Brazilian citizens have also been reported crossing the border into Bolivia to steal eggs and adult river turtles. One such incident occurred in 2000 in the municipality of Puerto Siles, on the shores of the Mamoré River. Mayor Armando Sosa claimed that local authorities discovered more than a million eggs and 1,500 adult turtles on board Brazilian vessels. Moreno told Mongabay Latam that river turtle eggs are also taken from the community of Camiaco, in the municipality of Loreto in Beni department. “Authorities indicate that about 3 million eggs and about 100 turtles leave the area annually. It is one of the worst threats to this species,” he said. The community of Camiaco hosts a “Turtle Fair” as part of the town’s anniversary, and many of the dishes on offer each year feature turtles as a central part of the meal. Who is stealing the eggs? 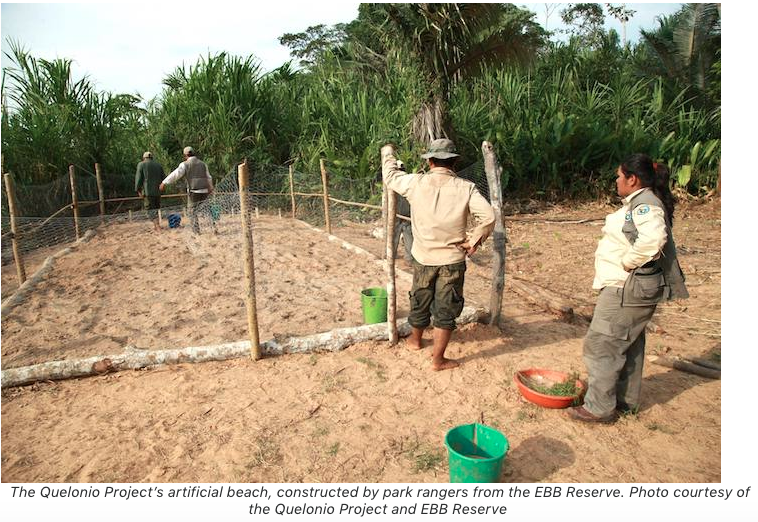 Vaca, the EBB director, said the seasons spent collecting eggs for the Quelonio Project are quite difficult. The Tsimané indigenous community is a valued partner in the project, but some members of the community who are not involved in the project take advantage of the hard work being done. Members of the Tsimané community are permitted by law to take turtle eggs for local consumption, in accordance with their uses and customs. But a large percentage of these eggs winds up in the local markets in San Borja, according to Mano, the veteran park ranger. “At the markets, there are also turtle eggs from Trinidad, but most of the eggs are from there, from the Maniqui River,” Mano said. He added that local fishers and transporters operating along the Maniqui River also kill the turtles to steal their eggs. A haul from six nests, amounting to between 180 and 210 eggs, can fetch about $30 in the local markets, Vaca said. The financial incentive from the illegal trade makes the Quelonio Project a challenge, she added. “We are looking for a balance so that people have a harmonious way of life with the species, and they eat eggs, following their custom, but so that they also conserve them to guarantee the turtles’ viability,” Vaca said. A 2011 study by researchers from the Wildlife Conservation Society describes a similar situation in the indigenous territory of the Tacana people, in La Paz department. During the spawning season, according to the researchers, several Tacana community members hunt adult turtles, mainly the females, and collect their eggs, which they occasionally sell to generate income. The buyers of such eggs come from as far afield as other departments in Bolivia, and even from Brazil. 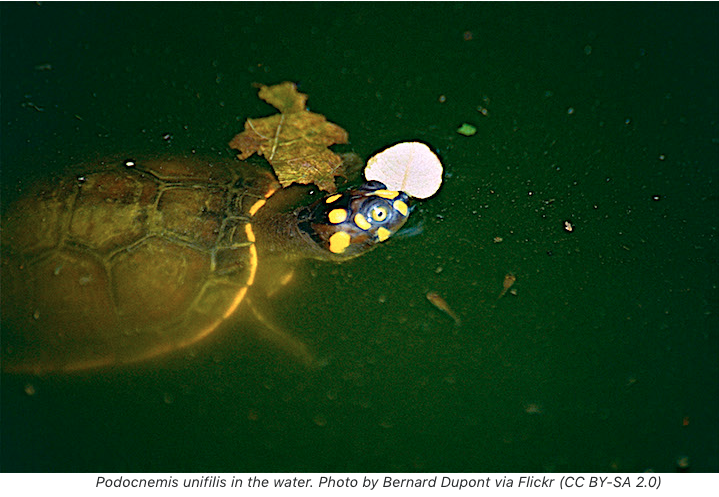 Another study, published in 2009 in Chelonian Conservation and Biology, examined the effects of hunting on the yellow-spotted river turtle population. It found that the impact was more severe the closer the turtles lived to human communities. “If hunting is the main reason for the distance-abundance relationship, then my study suggests that the hunting of turtles is contributing to the diminishment of their abundance,” said study author Kristen Conway-Gómez, from California State Polytechnic University, Pomona. 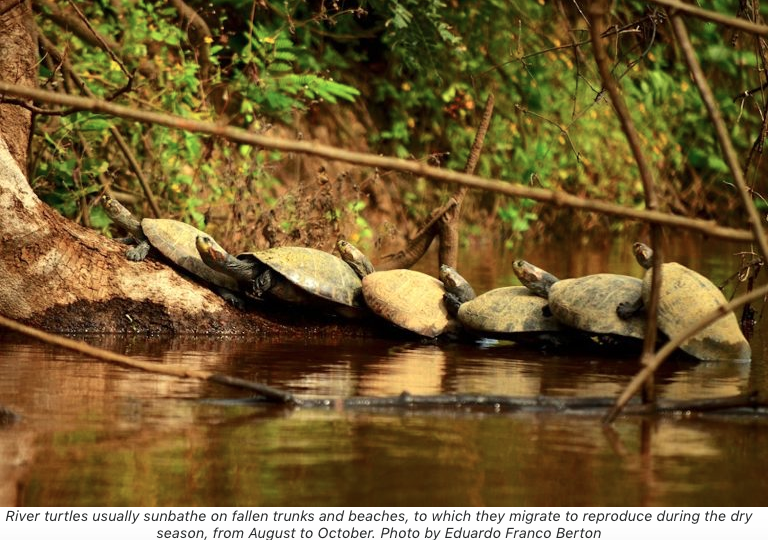 In Noel Kempff Mercado National Park, a protected area in Santa Cruz department, decades of the use of river turtles by residents has led to a vast reduction in their population, Conway-Gómez’s study found. Compounding the hunting pressure is demand from Brazil. These two factors are considered the main threats to Noel Kempff Mercado National Park. The Quelonio Project seeks to alert and educate the local population so that they understand that if steps are not taken to ensure the conservation and sustainable management of the species, it could disappear, Vaca said. A similar project is being carried out by the Beni departmental government. Unlike the Quelonio Project, this one also covers the Arrau turtle, which, while not deemed threatened by the IUCN, is categorized as endangered within Bolivia. As with its smaller cousin, the Arrau turtle has suffered from the theft of its eggs and of adult turtles. It’s a bigger species that lays more eggs per individual, 26 to 184, with a shorter incubation period of 42 to 68 days. At the end of December last year, the Beni government released 210,000 Arrau and yellow-spotted turtles into the Ibare River Basin, in the community of Loma Suárez. A study that hasn’t been published yet credits the Quelonio Project with contributing to the 5.4 percent growth in the population of the yellow-spotted turtle in the EBB, and says its impact “could even increase if the collection of eggs increases.” The study was led by researchers at the Institute of Ecology at the Higher University of San Andrés, in the capital, La Paz. This story was first published in Spanish by Mongabay Latam on Feb. 27, 2018. This entry was posted in Beni, Bolivia, Environment, La Paz, Santa Cruz, TIPNIS, Tourism and tagged Amazon under pressure, biodiversity, environmental awareness, Madidi Park, National Parks, NGO, park rangers. Bookmark the permalink.